The 2nd quarter saw the Fed continue its strategy of withdrawing stimulus from the US economy. Since December 2016, the Fed has raised rates three times, bringing the target rate up to 1.25%. Their most recent statements suggest the target rate will continue to rise if unemployment and inflation stay relatively stable. There have been several statements this month from Fed governors indicating the central bank plans to begin selling or rolling off the 3.6 Trillion dollars in bonds it has acquired since the financial crisis of 2008/2009. The Fed’s decision to increase its bond holdings by 400% during the financial crisis was an unprecedented action, and the reduction to more normal levels has been expected for some time. The net effect of these moves for investors will be a rise in interest rates, a reduction in liquidity, and a less attractive environment for risky assets. Bond investors should see rates continue to rise towards more normal levels, a relief since bond yields have been historically low for the past several years. The sale of the Fed’s bond portfolio will also reduce the amount of money in circulation (the money supply) as private investors purchase the assets the Fed sells. This is expected to put further pressure on stock prices and riskier assets as funds are directed into these purchases. Over the past few days, we have also seen the risk of political instability in the US rise to remarkable levels. It seems increasingly likely that the various investigations underway may lead to very senior members of the Trump administration and campaign facing a variety of charges. From a valuation perspective, stock prices continue to look overvalued. Remarkably, the top five components of the S&P 500 (Apple, Alphabet/Google, Microsoft, Facebook and Amazon) are all technology companies. What’s even more surprising is that with the exception of Apple, they are all trading at prices over 30 times earnings. Much of that gain has been recent, four of the five have seen gains of over 20% in the past six months (the exception is Microsoft). Taken together, these five companies represent almost 12.5% of the index. 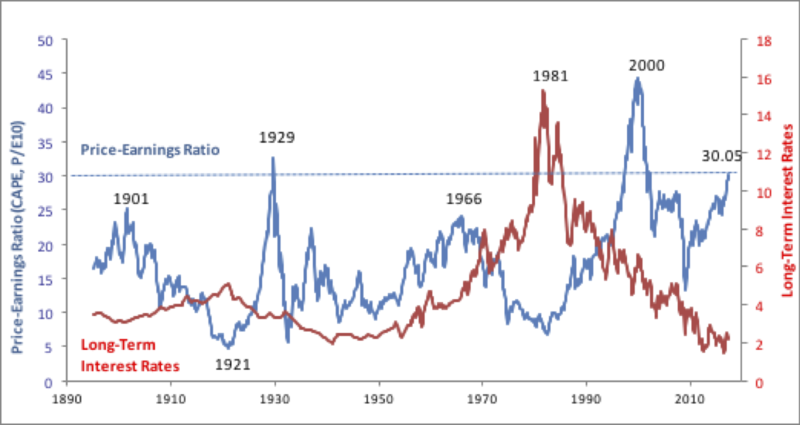 Overall market valuations are extraordinarily high, with the current P/E ratio for the S&P500 over 25. A longer term measure, which looks back at ten years of earnings (Cyclically Adusted or Shiller P/E) is illustrated in the chart below, alongside interest rates. Cyclically Adjusted P/E is at levels that have only been exceeded twice; before the tech-wreck of 2000 and Black Tuesday in 1929. This is partly because interest rates remain at historic lows. As discussed above, that is changing. As a result of these factors, we continue to maintain a defensive posture and recommend clients an underweight allocation to high-risk assets. We would like to use the rest of our quarterly letter to discuss a longer-term risk, one that impacts not just the markets, but all of human civilization. For several decades now, scientists focused on studying global warming and climate change have shared their increasingly dire findings about the impact of human activity on the Earth’s biosphere. It is now abundantly clear to all, except the intentionally obtuse and dishonest among us, that human activity has impacted the Earth’s climate in a significant way. Our species’ use of fossil fuels has released an extraordinary amount of greenhouse gases into the atmosphere, raising the average temperature across the world by 0.2° Celsius (0.36° Fahrenheit) each decade. Economists have long understood that markets can mis-price public goods or services that have concentrated benefits for a few while costs are diluted among many. Within the economic literature, this is called the “tragedy of the commons”. The classic example is shepherds grazing their flocks in a meadow that is commonly owned. In standard political and economic theory, the government is meant to intervene to enforce a solution that furthers the general good and recognizes and allocates the true costs of such activity. At this point, we should admit that US political institutions have failed to deliver on addressing climate change. The vast majority (85%) of greenhouse gases released into the atmosphere have been generated since World War II. Over that period, the United States has been, by far, the largest greenhouse gas emitter. So, much of the responsibility for climate change lies with us. Yet, we have been for decades, and still remain, the chief impediment to decisive action on climate change. The Trump administration has made a very bad situation even more dire by announcing a withdrawal from the Paris agreement. Nature, of course, couldn’t be less concerned about human politics. The content of greenhouse gases like carbon dioxide and methane has continued to rise, driving surface temperatures higher. This has manifested itself in a variety of ways. Glaciers have retreated across the world. The five hottest years in recorded history occurred within this decade, and 2016 set a new record. Coral reefs across the world are bleaching as water temperatures rise, stressing the marine eco-system. Hotter summers are impacting humans as well, with extreme temperatures rising causing heat-strokes, dehydration and deaths. Most climate change models have assumed a 0.2°C increase per year in surface temperatures will leave the Earth’s with an average temperature 2°C (3.6°F) higher by 2100. Those assumptions now look woefully inadequate. Since we have not measurably reduced our greenhouse gas emissions, and the Paris agreements seem to have collapsed, 2°C degrees is an underestimate and the case for a 3-4°C rise becomes stronger. As climate change and research into it has advanced, the risks of a runaway feedback loop have become clearer as well. Permanently frozen ground in the arctic regions of Asia and North America traps a large amount of methane. As the ground gets warmer, this methane leaches into the atmosphere. As temperatures rise and water becomes scarce, plant life across the world will be stressed. The risk and incidence of forest fires increases, and the loss of trees leaves more CO2 in the atmosphere. If rising temperatures, fire and drought impact major CO2 sinks like the Amazon forest, temperatures will rise even faster. 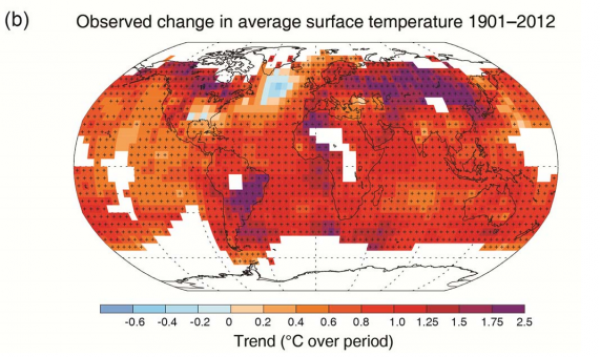 There is a reasonable likelihood that temperatures will have risen by 4-6°C (7-10°F) by 2100. 90°F days will be 100°F days. 100°F days will be 110°F days. Phoenix saw temperatures rise above 118°F last month, grounding flights. What happens when temperatures approach 128°F? If such an extreme rise in temperatures were to occur, the world is looking at a series of major catastrophies that could largely destroy human civilization. Drought and heat would cause widespread human suffering and deaths. Food stocks would be harder to grow with much of the world’s breadbasket regions in China, India, Central Asia and North America undergoing desertification. Much of the southwestern United States could become an uninhabitable desert. Tens of millions of people would need to be resettled. This pattern would be replicated across the world. A NASA study indicates the Middle East is suffering through a 20 year drought that is more severe than any in the past 900 years. There are indications that crop failure and rising food prices have contributed to societal upheaval in the region. The Mediterranean as a whole is susceptible to drought and desertification. The impact on agriculture worldwide would be many times more severe than seen during the dust-bowl. Marine life and fisheries would be devastated as ocean temperatures rise. And yes, sea-levels could rise 10 feet or more, making most coastal cities uninhabitable without civil works on a scale we have never seen before. Much of New York, London, Mumbai, Shanghai, Sydney, Rio De Janeiro, Singapore, Dubai, Miami, almost all of Bangladesh, and many island nations, would be lost. It is virtually certain that such extreme conditions will lead to widespread forced migrations and fuel conflict between nations and individuals. This is one of the reasons the US Department of Defense treats climate change as the largest strategic threat to the country. Governments and political structures will undergo immense stress and opportunistic charlatans could come to power across the world. All of this would significantly impact incomes, growth rates, earnings and most importantly health and well-being. We do not intentionally seek to be alarmist. However, the data and projections we have seen demand urgent responses and are alarming. There is a grave likelihood that we leave our children with a world in crisis. Without urgent, concerted action, large portions of our planet will become inhospitable to human inhabitation within our children’s lifetime. Clearly, these events will impact investors and markets in profound ways. As we engage in long-term, inter-generational planning for clients, we want our clients to know that we take these risks very seriously and will continue to keep these considerations in mind.